A Cure Is On The Horizon! As you know, CF is a genetic disease that causes a thick sticky mucus to form on the lungs and digestive system which can lead to difficulties breathing, risk for infections, lung damage, and digestive issues. This is a life threatening disease and the current life expectancy for someone with CF is early 40’s. Jeff and I are both carriers of a defective CF gene (which we didn’t know until I was pregnant). In order for someone to have CF, both parents must have the defective gene and in that case, there is a 25% chance of both defective genes getting passed on to a child. What complicates this even more is that there are more than 1,800 different mutations of the CF gene so there isn’t just one ‘cure’ for CF due to the complexities of the mutations. Sutton has 2 different mutations (one from Jeff and one from me). One is F508del ​(which is the most common mutation) and one is G542x (which is more rare). The story below is announcing that the Phase 3 trials for those with 2 of the F508del mutation are complete and an application to the FDA is will be submitted by the end of the year. About 50% of people with CF have 2 copies of this F508del mutation so if this all goes as planned, we will be closer to a ‘cure’ for about 15,000 people in the US with CF. WOW! Because Sutton only has one copy of the F508del mutation, this doesn’t directly affect her, but it is getting us one step closer to a cure as the trials and research continue. We would not have these amazing advancements without all of YOUR continued support to fund this life saving research. Team Sutton Grace has raised nearly $100,000 in just 20 months and its because of YOUR commitment to fight and walk on this journey with us, we really are one step closer to a cure. The story below has more details if you are interested in reading it. Thank you again from the bottom of our hearts for all of your encouragement and support. This announcement is ALL the more reason that we will continue on this journey and fight for our sweet Suttsy girl and others with CF everyday. We WILL find a cure and will do it with you in our army. What an exciting year 2013 brought to our family. We have come a long way since we started on this journey and have great hopes for 2014. I do realize that it is already March, but we have just been busy planning for 2014. We want to make sure we take every opportunity to make a difference and we will do our best. Our family, friends and foundations we are connected to are all on board and many have already started off the year in a sprint. 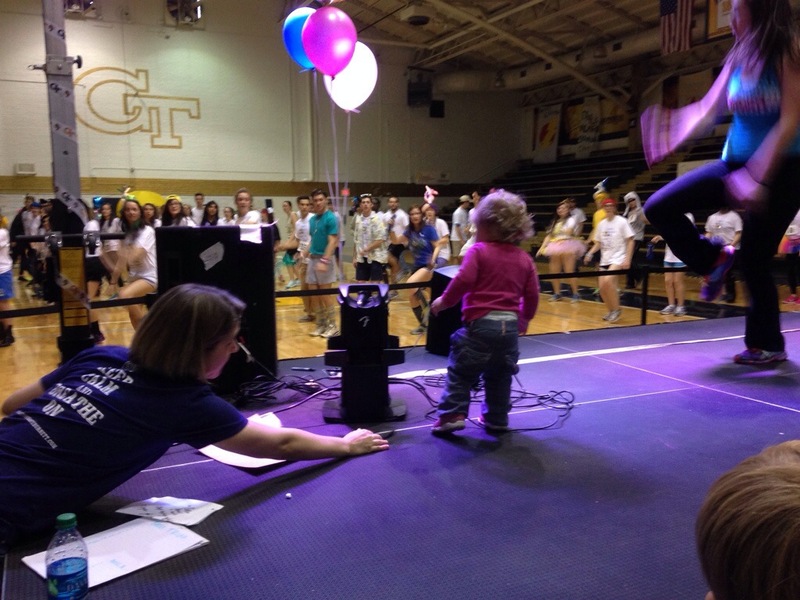 We had a great time at our first official Dance Marathon at Emory University. To see the passion of college students focused on kids is inspiring. 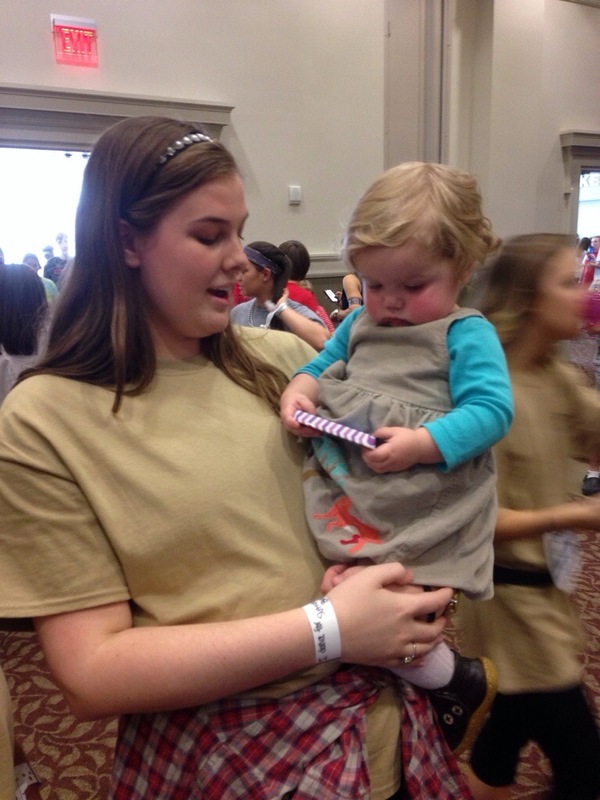 To see college students make children with health struggles feel on top of the world is something very humbling. We had a great time and can’t wait to go back next year. 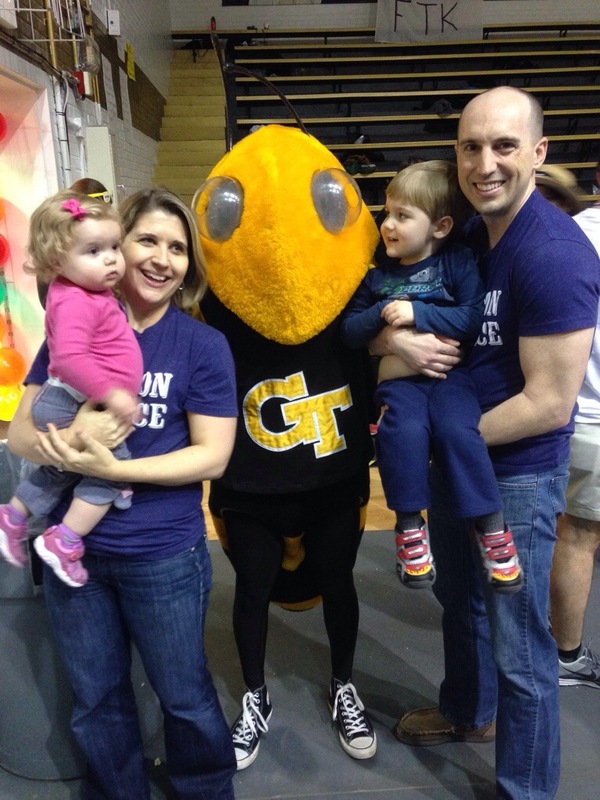 The Georgia Tech Dance Marathon was like being at home for us. We encountered another group of students with the same passion and caring as we did at Emory and UGA. 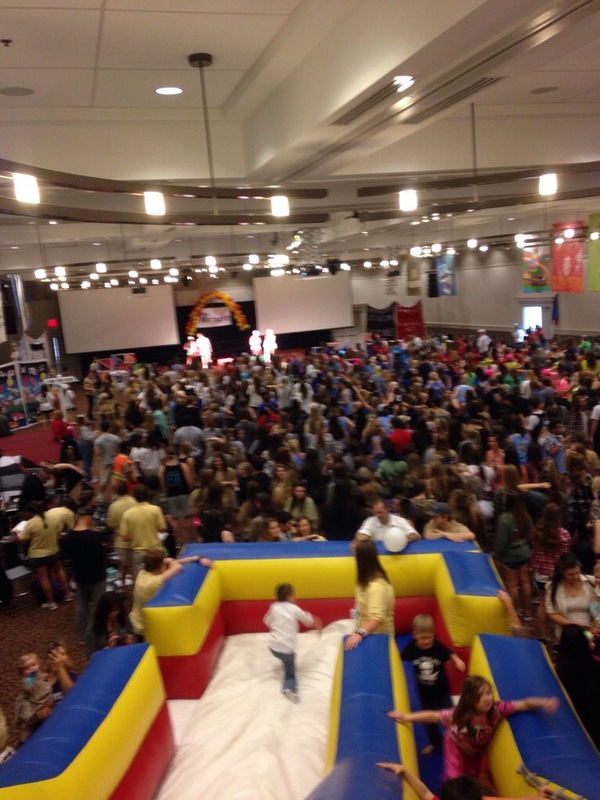 We were once again blown away by the selfless efforts of college students raising money to support CMN. We had the opportunity to hang out with some incredible students and hang out with Buzz! 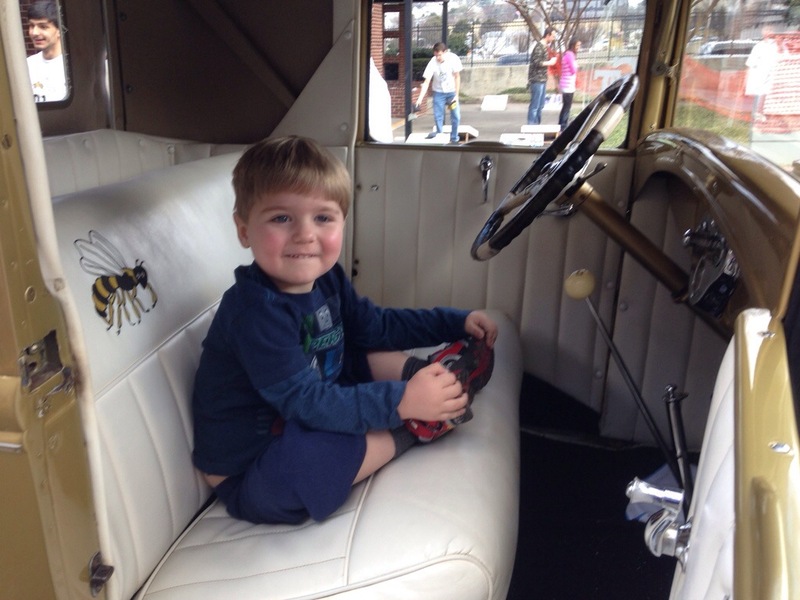 Hiatt spent most of the morning chasing around Buzz and sitting in the drivers seat of the Ramblin Wreck. Sutton was loved on by just about every girl there and even had a chance to hang out with the GT cheerleaders. We found out that there is a Sutton on the cheerleading squad this year and can’t wait for the girls to meet! It was truly a special day and one we will never forget. The Burnetts dont divide our efforts, we multiply them! We have so many great opportunities in store to help support both CFF and CMN/CHOA. Every opportunity we get to help raise funds and awareness for CF is one step closer to a cure along with so many more tomorrows for Sutton and every other CFer out there. Team Sutton Grace made such an impact this past year on raising money, awareness and hope. It is truly amazing to see how so many of you are already planning and fundraising with new ideas and expanding on the many events that we will participate again in support of CFF. There are many new ideas that are under way and we can’t wait to share them with you as they develop and raise even more money in 2014. $60,000 is a big number to beat, but we have confidence that we can do that and more this year with the support of all of you. We will be sure to keep you up to date through our many networks so that we can have a blast while also wiping CF off the map. This years calendar for CFF is already filling up and we would love to have you join us at any of the following official events. As always, you can join our team by searching for Team Sutton Grace or emailing us at teamsuttongrace@gmail.com. The DEFINITIVE party on the north side is BACK for it’s sixth year at the Verizon Wireless Amphitheatre in Alpharetta. ShamRockin’ For A Cure will rock again with our live 80s band, incredible food and drink, live auction, silent auction, and more entertainment in one night than you can imagine! Great Strides Atlanta Presented by Snellings Walters Insurance Agency is proud to be the largest cystic fibrosis walk in the country, raising over $1.4 million through the help of 2,500 walkers. Walk day is a fun, family-oriented event with a healthy 5k walk, children’s activities, food, and festivities that the Atlanta community looks forward to year after year. Black-Tie Optional Dinner Dance, Silent & Live Auctions, Heads or Tails Raffle, Champagne Reception, Seated Dinner with Wine Pairings, Live Music, Dancing Until Midnight! It’s your chance to be high class and in style all while curing CF. An amazing night worth every penny! An amazing night of food, drinks and fun! Atlanta chefs from you favorite well known restaurants battling it out for the best dish. The best part is that the guests are the judges. Keep and eye out for this years info for a great time you won’t want to miss. Get your wheels in motion and join us for our 11/8/2014 annual bike tour as we ride through some of the most picturesque and scenic terrain in Atlanta, Georgia. CF Cycle for Life is a fully-supported ride with route options of 15, 30 & 65 Miles miles. From breakfast to our cycle post party, you can enjoy fully stocked rest stops every 10-12 miles, bike mechanics for bicycle maintenance and repair, ride marshals to cheer you along the way and plenty of support vehicles to help you complete the ride. This unique event empowers participants to take action and demonstrate their fight in finding a cure for cystic fibrosis in a tangible, emotional and powerful way. Not forever, but some of you were thinking it… Brittany and I are humbled and honored to be invited to the 2014 CF Foundation National Volunteer Leadership Conference in April. It is an amazing opportunity to connect with other dedicated volunteers from around the country and share ideas on how to win our battle against CF. We are going as guests of CFF in Georgia and can’t wait to report back to all of you on what we learn. We are excited about the year to come and all of the great opportunities to make an even bigger impact on CF than before. We couldn’t do this without all of the people we like to call Team Sutton Grace which includes you! Be on the lookout for news to come! What a year it has been. This past year has shown us love, compassion, endurance, understanding, patience, and most of all a knowledge of persistence to fight for the things that we are passionate about. We have seen the inside of just about every ED room at CHOA Egleston with over a dozen visits. There is a lot to be said for the Nurses and Doctors that have been a part of our lives as we rush in to the ED, heart racing and not knowing what we should do, yet somehow, the CHOA ED staff always makes it “All Better” in no time, showing compassion and care for all of us. We have learned that having CF also gets a ticket into a room much quicker than normal. A trip with Hiatt reminded us that non-CFers have to wait the 2 ½ hours for a room on a busy night. We have met the entire team of Nurses and Respiratory Therapists as we called “5 West” home five times, learning the do’s don’ts of CF hospital stays. We learned how to manage our family, work and hospital life all in the same breath. We learned that the hospital sink makes a great Jacuzzi for an infant and a comical relief from hospital life. We learned that the nurses of “5 West” are truly special and have a genuine heart for what they do, taking extra time and care with each child that enters its walls. We have experienced a true sense of gathering from out family and friends. One amazing thing about CF is how it touches people and they grow a passion for fighting beside us to cure the disease. Our family and friends have joined us this past year in raising just shy of $50,000 as a part of Team Sutton Grace for a cure to CF. We have experienced more love from our family and friends this past year, helping us feel a great sense of support. Corrie Smith has made a commitment to volunteering at the CF office this coming year, once a week, to help fight for her cousin. Tim and Amy Smith have put together a fundraising event that has the hopes and potential to grow each year in support of Team Sutton Grace. Sue Shaw and Becky Burnett have been our largest fundraisers and have played a huge role in building Team Sutton Grace. Britt and Sammie Williams have been instrumental in support of our home life with last minute calls to help with Hiatt and Sutton and just showing up at the right time, when we need it most. 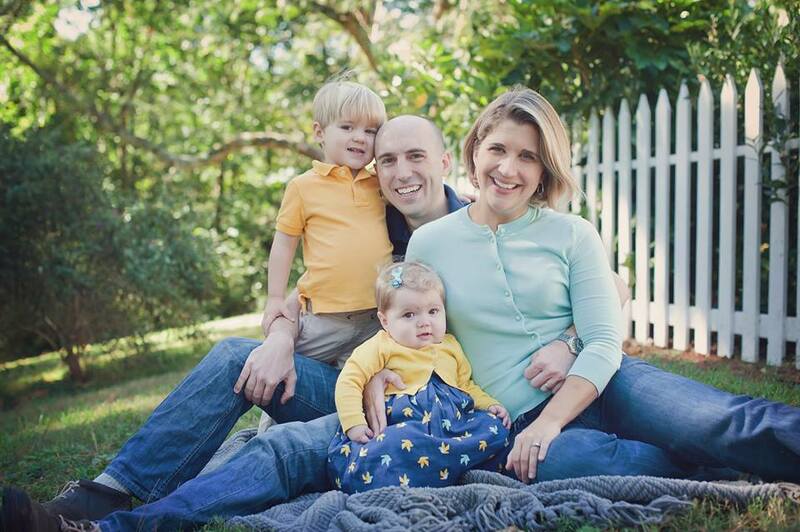 JV Gortney has been a supporter, fundraiser, executer, builder, planner and gives so much of his time to help Team Sutton Grace grow and has been critical to the success of our fundraising. TJ, a long time friend and part of our family, has gone the extra mile to make sure everything is perfect with our stays in the hospital, always there on those late nights when Sutton isn’t well and helps us figure out what is best, and always supporting us in every way she can. Joan Turpin has been a huge support with an extra set of hands at the hospital and at home, not to mention she can get the kids fed, bathed and in bed all before 8pm. George and Ellen Burnett will pick up and drive to the hospital or take Hiatt in their home when we have too much to cover on our own. Dr Kim Wise gives us extra attention and has been fully invested in Sutton’s growth and care, even in her personal time. The teachers and staff of day care have gone the extra mile, taking on the daily meds, extra special cleaning, our eyes and ears for health and growth and making sure they are just as much a part of Sutton’s care during the day when we are off to work, going above and beyond the normal duties of their job. The countless friends, friends of friends and even strangers that have supported us in fundraising and encouraging words that get us through each day. The list goes on and on. We have learned A LOT about CF, with so much more to learn as we go day by day, with 2 hours of treatment, ever changing medicines, doctors visits and every proactive thing we can do to fight CF. 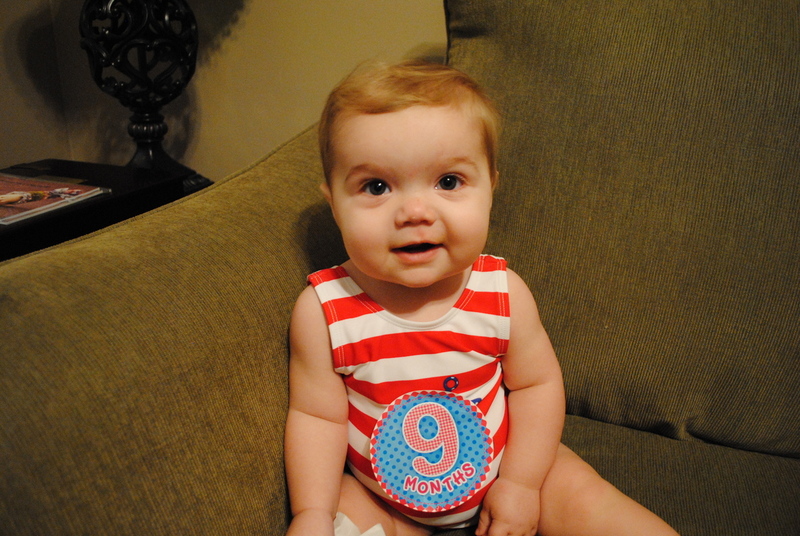 We have become experts at administering pills to a 5 day old through a 1 year old. We have learned the scientific explanation and the conversational explanation of CF and just how to explain it to everybody. We also have learned that we have so much more to learn. We have made so many new friends through CF. The CF Foundation has become a part of our family and our lives. They are always there for us and go the extra mile to make us feel special as well as all the other CFers. The numerous families that have CF children who share the same passion for a cure gives us a hope with a cure on the horizon. With only 30,000 CFers in the US, we sure have felt like there are so many more with the number of connections we have made. The best part is comparing notes on how to live life, making things as simple as possible for our children. We have met some inspiring CFers that give us hope for the future as they have paved the way to make the lives of the younger CFers easier. They have beat the median life expectancy given to them and are conquering CF with confidence. We have watched our family of four grow into something amazing. Brittany has become the biggest super mom in the world. If you ever want to see somebody conquer the 25 hour day, come to our house at 530am and watch the wonders of a mom with a full time job, toddler, dog, husband and CF kid tackle the day, hit the pillow and get up the next day to do it all over again. (By the way, we don’t get weekends off). Hiatt has grown to be a part of Sutton’s daily life, making sure the “tickle’ vest and the nebulizer are set up correctly and in full working order, day and night. You better be careful not to try to manage these tasks on your own, otherwise you will experience an upset 3 year old, shut everything down and start all over. Those jobs are for Hiatt and he wants to be a huge part of Sutton’s therapy and life, teaching her things every day. 2014 is a new year for us. We are hoping for adventure, growth and success. We are hoping for a monumental year for CF research and breakthrough. While it doesn’t work for Sutton, another miracle drug is on the horizon for another large group of CFers, giving us hope that Sutton’s miracle drug is coming. We won’t stop fighting until CF stands for Cure Found. As we close our 2013 and the long, tiring year it has been for us, we want to say how humbled we are by this past year. We have been making an effort to thank everyone individually for the support you have given to us. There are so many of you and I know we have somehow missed a few, but know that we will get caught up one day and won’t stop until we do. But for now, we want to make sure that everything little thing done for us is greatly appreciated. And the last thing I want to close this year worth of blogging, and the biggest thing we have learned, THANKS and that there is still time to donate for 2013 to CF by going to www……, just kidding. With Sincere Gratitude, Thank You All! We have made it through another amazingly short hospital visit. Sutton was released to come home for her protection from other illnesses lurking at the hospital. She still has some junk inside her, but we are able to manage the treatments at home for now. There is some good and bad to it all though. Sutton and Hiatt have to be separated for a few days and with a house built for a mouse, we had the challenge of sending Hiatt off to “Pop’s House” for a few days. Good news is that I will get to spend some great one on one time with Sutton as we prepare for her One Year Birthday Party this weekend. All in all she seems to be doing better every day and we will again stop at nothing to help her get to her best. …I am now on the list for a double-lung transplant. And every day is beautiful. I have known for over a year that this was my fate. And I have had many dark moments because of it. But through the darkness, one thing has always helped me to rise above. Brittany and I took a chance to connect with her and discussed meeting Rosie and visiting her through her recovery. We got busy, things got hectic and we just never had time. Time is an important lesson that Rosie taught us as well as love. We learned later that Rosie had her new lungs but they didn’t agree with her body. 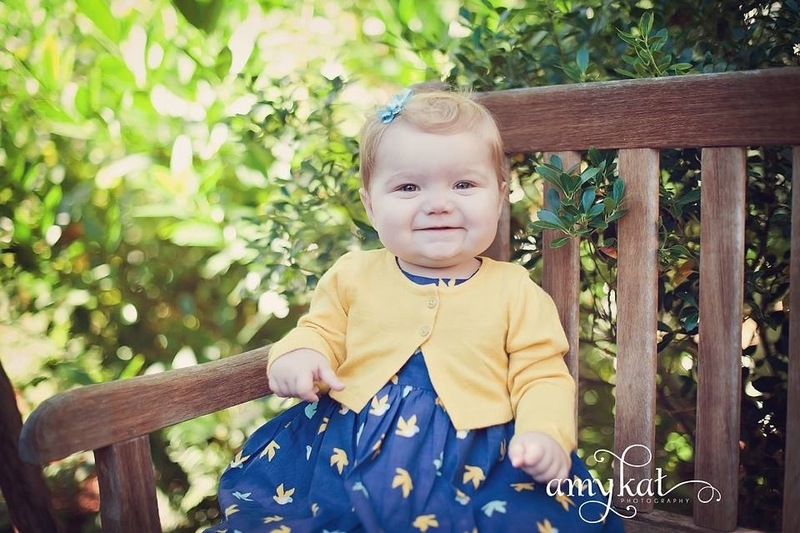 Rosie’s body was defeated by CF, but her heart and soul defeated the disease with compassion. Rosie passed on June 17, 2013, almost a week before her 26th birthday. 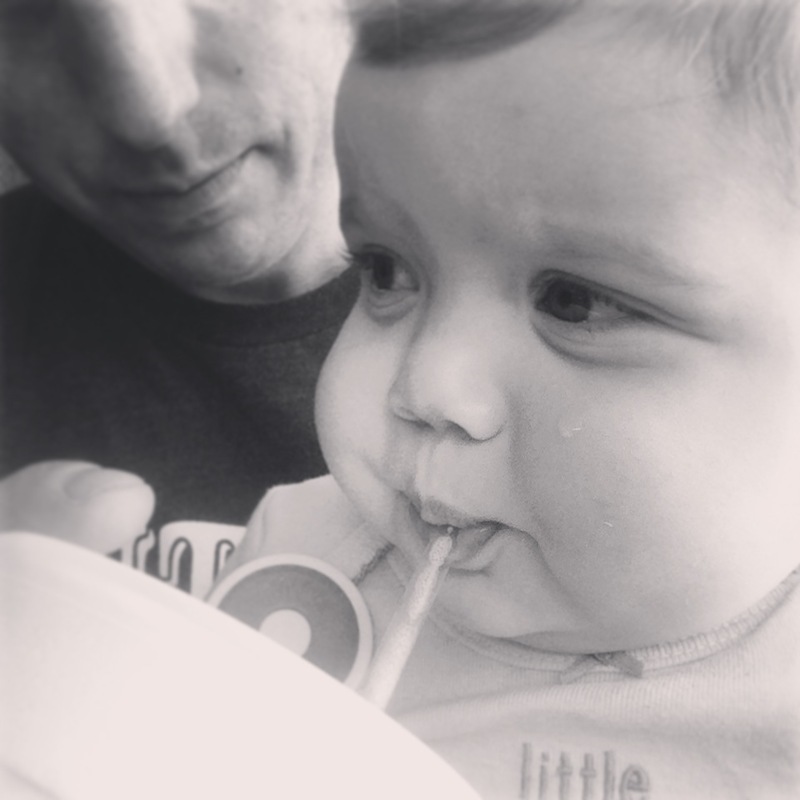 You are probably wondering why I am sharing such a sad story, but that’s not the case at all. Rosie, though we never met her, was a beautiful, positive, caring, loving and giving individual. For her 26th birthday, she asked for friends to give 26 Acts of Kindness. She wanted to spread love through the world. Rosie said “All I want for my birthday, and every day, is to spread love. Please help me in doing just that. I could not ask for anything more”. Rosie’s wish was held true and the random acts go above and beyond 700. She shared her gifts with everybody and while her reports of acts stopped at 718 on her blog, I see from the countless notes on facebook from friends and strangers alike, that her acts of kindness will go on forever. This year we are riding in Honor of Sutton, but also in Memory of Rosie Alma. We are asking that each of you that give to our ride in Honor of Sutton, Ask one friend, family member, co-worker or even stranger to give another donation in memory of Rosie. We also ask that each of you give one random act of kindness in memory of Rosie. We can end this disease, we have to end it. We are reminded of its harshness every day, all day as we take care of Sutton. It is our wish for Sutton to tell her grandkids about the horrible disease that used to exist, but that we fought it down to nothing, and that if we put our minds and energy into something, we can do our best to make it happen. Help us show Rosie’s love for this years Cycle for Life. We are on the edge of something that can cure CF for everybody. Through all of the struggles of our country, we are afraid of the medical struggles that might lie ahead, but we can’t wait on others. We have to move ahead. We will fight to add every tomorrow we can for Sutton and continue to pass of Rosie’s love for all.